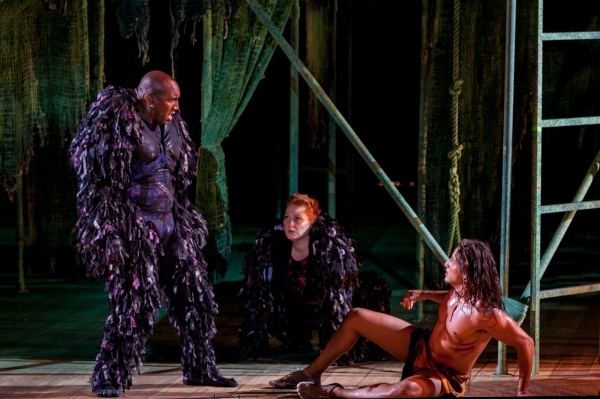 I have to admit I was not expecting much from this production of Disney’s Tarzan at the Muny. I had heard mixed comments about the stage show, and although I like the Disney movie on which it is based, I didn’t know how well the film would translate to the stage. Well, after seeing it this week, I’ve decided that the Muny really has its act together this year. While the show itself does have its flaws, the Muny’s production is surprisingly entertaining, with an impressive cast and pleasing but not too flashy production values, all working together to present an engaging rendition of the classic story. Tarzan, based on the Disney animated film version of Edgar Rice Burroughs’s well-known tale, tells the story of the son of shipwrecked travelers (Max Clayton, Emma Gassett) who is orphaned when his parents are killed by a leopard. The infant is then adopted by the gorilla Kala (Katie Thompson), whose own young son has recently been killed by the same leopard. Despite the doubtful discouragement from her mate, Kerchak (Quentin Earl Darrington), Kala raises the child, whom she names Tarzan, to become a determined young boy (Spencer Jones) who wishes to prove himself as valuable to the family group. He befriends a mischievous young gorilla named Terk (Nathaniel Mahone), and strives to be accepted by the increasingly distrustful Kerchak. As Tarzan (Nicholas Rodriguez) and Terk (Gregory Haney) grow into adulthood, Tarzan continually wonders about his place in the world, as a human raised by gorillas. The arrival of English explorers Jane (Kate Rockwell) and her father Professor Porter (Ken Page) further exacerbates Tarzan’s dilemma when Tarzan and Jane become increasingly attracted to one another and Tarzan begins to learn more of what it means to be human. Meanwhile, while the Porters are eager to study the gorillas and learn how they live, their greedy guide Clayton (Michael James Reed) only views the gorillas and Tarzan himself as a means for his own profit. On paper, this musical has a lot going for it, with a score by well-known rock/pop musician Phil Collins and a book by celebrated playwright David Henry Hwang. Structurally, though, it has its problems, with the story not really starting to move forward until Tarzan is an adult, despite the fine performance of Jones as the earnest young Tarzan. The songs are hit-or-miss, as well, with memorable songs from the film such as “Two Worlds, One Family” and “You’ll Be In My Heart” getting good renditions here, although other songs suffer from not being particularly melodic or memorable. There are also some slight changes to the ending that I don’t think work as well, and the role of Clayton is minimized so much that it doesn’t give the talented Reed very much to do. The show also seems to have a lot more energy and momentum in the second act. All that said, however, it’s the casting and overall production that make this show work, ultimately. 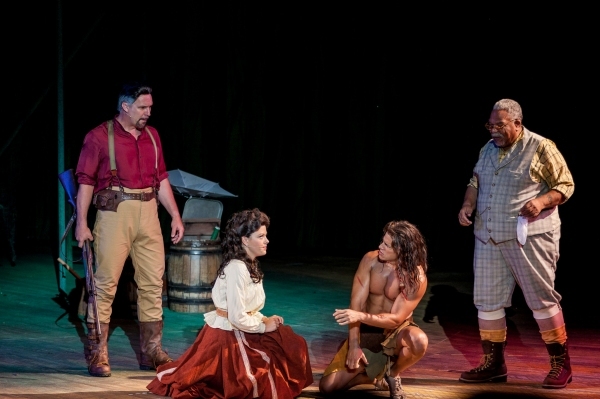 Rodriquez is excellent as Tarzan, with a lot of personality and stage presence. He and Rockwell display wonderful chemistry, and their scenes together are a real highlight of the show. I especially enjoyed their Act 2 songs “Like No Man I’ve Seen” and “Strangers Like Me”. Thompson is also extremely effective as the loving and fiercely protective Kala, and Darrington brings a great deal of strength to the role of the stubborn, proud Kerchak. Thompson and Rodriquez have a great moment late in Act 2 with the reprise of “You’ll Be In My Heart”, and Thompson leads the energetic “Son of Man” production number, in which Tarzan grows from a child to an adult, with authority. Haney displays good comic timing and a great deal of energy as Terk, as well, as he leads a fun dance number with the gorillas at the beginning of Act 2 called “Trashin’ the Camp”. Muny favorite Page is charming as Professor Porter, and there’s a very strong ensemble, as well, contributing to the overall energy and drama of the show. The staging and choreography work well with Timothy R. Mackabee’s striking unit set, which is basically a “jungle gym” type structure that represents the trees in which the various apes and animals climb, and Tarzan swings and slides up and down on ladders and poles rather than swinging on vines. There are a few flying moments in which Tarzan swings over the audience, such as Rodriguez’s initial entrance as the adult Tarzan in the “Son of Man” number. For the most part, though, the acrobatics are confined to the small-ish set, which is clever and colorful even though it sometimes seems a bit too small for the giant Muny stage. The costumes by Leon Dobkowski are clever, especially for the gorillas, who are more stylized than literal in appearance. Jane’s first costume looks a little cartoonish, although the other outfits are well-suited to the characters. The overall jungle atmosphere is well-realized here, adding to the mood of the show and the energy of the performances. While the show itself has its structural problems, the Muny has done their best with it, and the result is a very entertaining show, if not a brilliant one. This is another impressive production from the Muny, and it’ still early in the season. It bodes well for the rest of the shows, as I’ve been somewhat doubtful about some of the productions chosen this year. With its themes of self-discovery, communication and familial love and acceptance, this is an excellent show for all ages as well. This goes to show, in keeping with the show’s message, that preconceived expectations can often be wrong, and that every show is worth a chance. 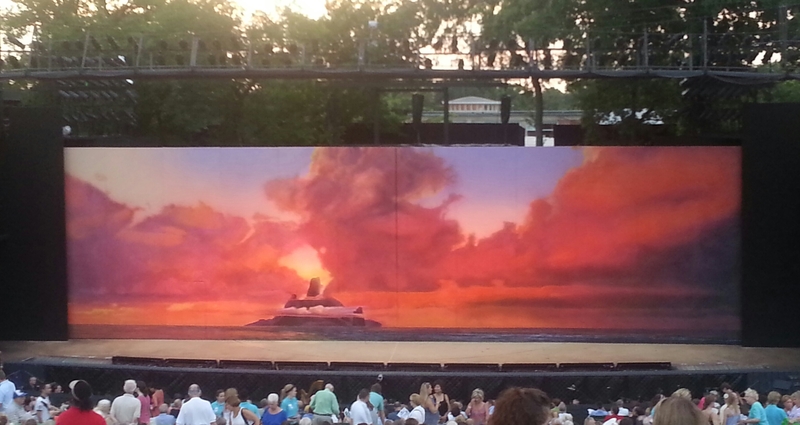 Tarzan at the Muny is definitely a production worth checking out. Whenever anyone asked me when I was younger (college age) what my favorite movie was, I would have two answers—Citizen Kane and Mary Poppins. I answered this way mostly because it was true, but also because I loved the reaction I got. Still, even though I now have quite a few more movies on my favorites list (it’s too difficult to choose just one), the Disney film of Mary Poppins is one of my all-time favorites going back to when I first saw it on TV as a child. I loved the sense of whimsy about the whole film, and the memorable songs and characters. In 2006, on my first trip to London with my family, we saw the stage production at the Prince Edward theatre and I loved that as well, even though in many ways it’s different than the film. Now, the Muny has brought the show to the enormous stage in Forest Park, in a production that is at once colorful, charming, funny, mysterious and completely enchanting. The stage show takes inspiration from the popular Disney film as well as P.L. Travers’s original book series, adding elements from the books and rearranging some of the scenes and songs from the movie, with a few songs added by songwriting team of George Stiles and Anthony Drewe. The story, as in the film, follows the Banks family—parents George (Stephen Buntrock) and Winifred (Erin Dilly), and their free-spirited but neglected children Jane (Elizabeth Teeter) and Michael (Aidan Gemme), who have made it their mission to drive out all the nannies their parents have hired. Their mischievous efforts are thwarted by the arrival of Mary Poppins (Jenny Powers), a nanny like no other, whose unorthodox methods and stern-but-caring demeanor changes the lives of all of the members of the Banks family for the better. The story is narrated all the while by Bert (Rob McClure) a charming, itinerant Jack-of-all-trades who accompanies Mary and the children on their various adventures. For the most part, I like the changes. The film will always be in a class of its own and it will always be there to watch and enjoy, but in order to turn a film into a stage show some adaptations, adjustments, additions and subtractions are necessary, and I think the team behind Mary Poppins has made the adaptation very well. My only real criticism on that point is that the parents (and especially Mrs. Banks) are made much less quirky in the stage show and can come across as bland even with excellent actors in the roles. Some of the subplots from the film have been removed and some songs (such as “Jolly Holliday”, “A Spoonful of Sugar” and—most spectactularly—“Supercalifragilisticexpialidocious”) have been re-set in a way that makes more sense on stage. 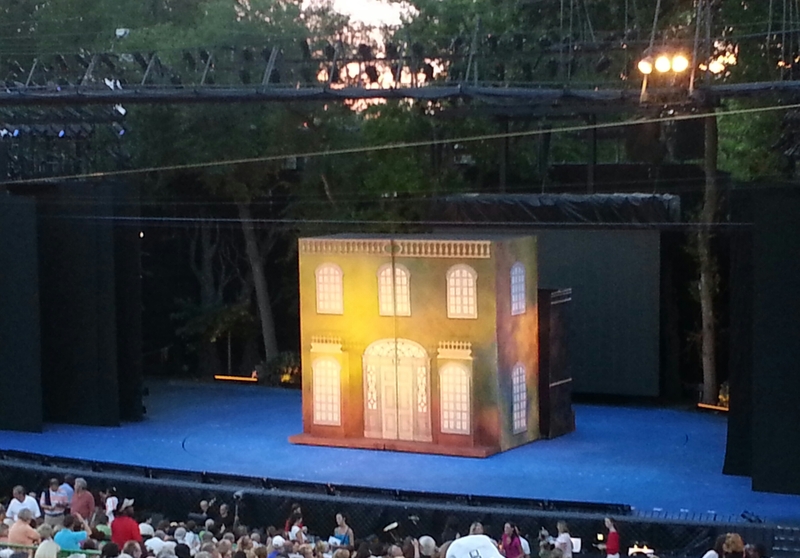 The Muny’s production is big and colorful, fitting for the gigantic stage, and with an excellent cast. The British accents ranged from pretty good to practically non-existent, but otherwise I thought the performers were strong and appealing. Powers took a bit of time to get the right level of energy for Mary Poppins, seeming a bit too staid at first, but by the second act she had it right—with just the right balance of toughness and concern, with a truly wonderful singing voice and great rapport with the children and especially with McClure as Bert, who as far as I’m concerned was the real star of this show with all of the charm, presence and likeability required for the role as well as excellent dancing ability. Teeter and Gemme as the children also put in winning performances, and real-life married couple Buntrock and Dilly were appealing as their parents. The cast was rounded out by some very impressive performers in the smaller roles, most notably Rebecca Finnegan in multiple roles (especially as Mr. Banks’ nightmarish former nanny Miss Andrew) and Laura Ackermann as the Bird Woman. The ensemble of dancers was extremely strong as well, showing of their abilities to delightful effect in the big production numbers like “Jolly Holiday” and “Step In Time”. The larger production numbers are where this production really shone. Mr. Banks often expresses his desire for “Precision and Order” (that’s a song, as well) in his household, which often descends into chaos before a balance is eventually found with the timely intervention of Mary Poppins, but here that bears out in the production as well. In songs like “Supercalifragilisticexpialidocious” (the hands-down best scene in the show) and “Step In Time”, the precision of the choreography makes order out of the seeming chaos of the situation. There is real suspense, for instance, in “Supercali…” when the huge ensemble with their letter placards assemble to spell the word, until it all gloriously comes together at the last possible second. It’s amazingly timed, making full use of the huge Muny stage, and to marvelous effect. “Step In Time”, “Jolly Holiday” and new song “Anything Can Happen” are also extremely well performed and add to the sense of whimsy, adventure and wonder of the show. The technical aspects of the production contributed very well to the atmosphere as well, with the brightly colored modular set, colorful costumes and well-executed lighting effects. The flying was interesting. It worked very well especially at the end when Mary Poppins flew out over the audience (a Muny first, apparently), but seemed clunky at other times in the show, with no attempt to disguise cables and harnesses, even though oddly the clunkiness often added to the charm of the production. Mary Poppins is ultimately about finding order in chaos and helping parents to understand their children (and vice versa), and about finding adventure and wonder in the everyday tasks of life. It’s a great show for families to see together, as it’s a show that successfully appeals to all ages. My personal fondness for the film has remained strong over the years, and I think the stage adaptation stands well on its own. I was glad to b able to see it again in such a delightful setting. The Muny’s production brought out all the wonder and charm of the piece, and the overall result was magical. Do You Hear the Muny Sing? It’s no secret that I love Les Miserables. It’s been one of my favorite musicals since I was in high school in the 1980s, but for various reasons I had never seen the show live until the Muny produced it for the first time in 2007. That production was excellent, and it was great to finally see this all-time classic live onstage (I have since seen it twice in London as well). Now, six years later, the Muny is producing this wonderful show again, in a production that emphasizes the youth, energy and revolutionary spirit of the piece. The outdoor setting is ideal and adds to the overall ambience of this remarkable production. I know the story by heart by now, of paroled convict Jean Valjean, who served 19 years hard labor for stealing a loaf of bread and then trying to escape, who is shown kindness by a bishop and turns his life around, breaks his parole and is pursued by the determined Inspector Javert. Valjean takes in Cosette, the daughter of the ill-fated factory worker-turned prostitute Fantine, and flees to Paris, where years later they find themselves in the middle of a student rebellion. It’s a story that explores themes, among others, of perseverence, loyalty, legalism vs. mercy, idealism vs. injustice, and fatalism vs. optimism and hope in the midst of tragic circumstances. It’s a timeless tale that has been adapted many times, but the musical has become the most recognizable for it’s compelling portrayal of these themes and characters, and its truly spectacular score, played here with verve and fervor by the wonderful Muny orchestra. Hugh Panaro is an excellent Valjean, emphasizing the character’s great strength, displaying an excellent voice especially in his upper range, delivering a beautiful rendition of the prayerful “Bring Him Home”. He plays the transition from convict to respected citizen to secretive fugitive well, and his scenes with Norm Lewis as Javert are particularly strong. Lewis, who has previously played the role on Broadway and in the televised 25th Anniversary Concert, makes an ideal Javert—rigid, unyielding and yet displaying a passion for his ideals. “Stars” is a highlight in an evening of many strong moments for him, and he was one of the three real stars of this production for me. The other two star performances, as far as I’m concerned, come from Michael McCormick and Tiffany Green as the villainous innkeeper-turned-thief Thenardier and his wife. I loved the physical contrast between them—the smaller, oily, sneaky McCormick and the statuesque Green, who towers over him and displays a strong, booming voice and lots of attitude. Every moment they are onstage is a highlight, from the show-stopping “Master of the House” to their swansong “Beggars at the Feast” and everything in between. For the younger roles, director Richard Jay-Alexander has cast a collection of promising young performers–many of whom are college and university students–including Charlotte Maltby as the tragic Fantine, Alex Prakken and Katie Travis as the young lovers Marius and Cosette, Lindsey Mader as the the Thenardiers’ daughter Eponine, and Bobby Conte Thornton as the charismatic revolutionary leader Enjolras. Maltby in particular is a standout–with a gut-wrenching interpretation of “I Dreamed a Dream” and a poignant death scene. Her visceral anger at Valjean when he first tries to help her is strikingly powerful. Prakken and Travis are wonderful as well, displaying excellent chemistry in all their scenes together. They were particularly strong in their first song together, “A Heart Full of Love”, portraying all the excitement and awkwardness of that first real meeting and making this love story more compelling than in some previous interpretations. Thornton as Enjolras shows off a strong voice and a whole lot of charisma, leading stirring renditions of “Red and Black” and “Do You Hear the People Sing?” and igniting an infectious fervor for the students’ cause. Rounding out the younger adult principals is Mader in a fine performance as Eponine, portraying the character as gutsy, melancholy and waifish and with a strong voice. Young Jimmy Coogan as the urchin Gavroche also gives an extremely strong, scene-stealing performance, and his last scene is heartbreakingly compelling. This is a very large show with a large cast, but the production values made the proceedings seem more immediate and intimate than in the previous Muny production. The ensemble, portaying factory workers, urchins, students, city dwellers and more, is top-notch and in excellent voice, and the production is impeccably staged. The set, by Rob Mark Morgan, is simply magnificent—minimal but perfectly suited, with towering shutter-like setpieces that are moved into position to set the various scenes, and a few other simple pieces like the gates for Valjean’s house in Paris as well as the towering, stage-filling barricade that is the center of much of the action in the second act. The electronic scenery wall is also put to good use, providing backdrops of city streets that are sometimes reminiscent of the Les Mis film. The lighting, emphasizing shadows and contrasts, set the mood and added depth and interest to the already compelling story. The production also made excellent use of the Muny’s large turntable for very smooth, fluid scene changes and keeping up the pace of the epic plot. 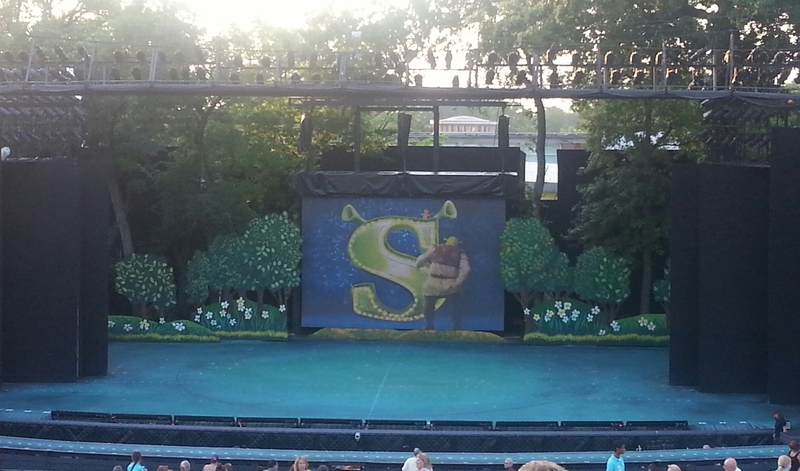 This was, overall, an even better production of the show than last time at the Muny. Rather than emphasizing the sheer size of the show, this production seemed more intimate, and that made for a powerful presentation of this timeless tale. For all the tragedy of this show, the final message (in the magnificent finale) is one of hope for the future. With this production, the Muny has taken its audience on a memorable journey, and I’m glad I went along. This self-confessed “Les Mis geek” is thoroughly impressed! It’s a tropical atmosphere at the Muny this week, and that’s not just because of the weather. South Pacific, Rodgers and Hammerstein’s classic musical about an island Naval base in World War II, is being produced this year by the same team that produced The King and I last year, including director Rob Ruggiero, choreographer Ralph Perkins and leading lady Laura Michelle Kelly. Like The King and I, this show addresses issues of cross-cultural relationships and overcoming prejudice, but South Pacific is more of an overt romance that also deals with various situations of military life on a tropical island and the looming specter of war. All of these themes are very well represented here, in a production that is both true to its classic origins and accessible to present-day audiences at the same time. This is a story that centers around Ensign Nellie Forbush (Kelly), a Navy nurse who finds herself falling in love with the charming French planter Emile de Becque (Ben Davis), who is harboring personal secrets that force Nellie to confront some rather unsavory attitudes within herself. Nellie’s story also coincides with that of Lt. Joe Cable (Josh Young), a young officer on a dangerous mission who also has to deal with his own inner conflict as he struggles with his feelings for Liat, the daughter of the enterprising Tonkinese merchant Bloody Mary (Loretta Ables Sayre). It also deals with the lives of Navy Seabees, exemplified by Luther Billis (Tally Sessions) and his cronies, as they deal with their forced exile on the island away from the comforts of home and–for the most part–the company of women. There are many classic songs that range from comic (“Honey Bun”, “There Is Nothing Like a Dame”) to romantic (“Some Enchanted Evening”), to joyous (“I’m In Love With a Wonderful Guy”) to caustic (“You’ve Got to Be Carefully Taught”) to heartbreakingly regretful (“This Nearly Was Mine”). It’s an oft-performed classic that’s been given new energy and immediacy in this production by use of simple but ideally suited design elements and with a no less than superb cast. Kelly, as Nellie Forbush, shines with all the optimism, energy and stage presence needed for the role as exemplified especially in “Cockeyed Optimist” and “Wonderful Guy”, as well as an excellent voice. Despite a slightly uneven Southern accent, she expertly handles both the comic and dramatic aspects of the role, displaying both youthful exuberance and, when necessary, mature reflection such as in the moving reprise of “Some Enchanted Evening”, and her chemistry with Davis is wonderful. Davis portrays the noble, haunted Emile with considerable charm and magnetism, and his voice on songs like “This Nearly Was Mine” is stunning. He makes it very easy for the audience to believe why Nellie can fall in love with him in a matter of weeks. Young, as the conflicted Marine Lt. Cable, displays warmth and cynicism equally well, and his scenes with Liat (Sumi Maida) are intense and compelling. Ables Sayre, who played Bloody Mary in the celebrated Lincoln Center revival, brings her remarkable performance to the Muny stage, taking a character who could be played as one-dimensional and giving her a fully-realized portrayal–at turns comic, witty, sarcastic and scheming while demonstrating real concern for her daughter. She brings life to songs like the dreamy “Bali Ha’i” and a surprising desperation to the seemingly upbeat “Happy Talk”. Also giving a winning performance is Sessions as the endearingly conniving Seabee Luther Billis, and his performance of “Honey Bun” with Kelly is one of the comic highlights of the show. There is also an excellent ensemble playing the various Navy men, Marines and nurses, with strong voices and a boatload of exuberant energy in the big production numbers. Adding to the overall atmosphere of this production was the simple but ideally suited set, designed by Michael Schweikardt, consisting primarily of a single revolving set piece with additional elements brought in for various scenes such as the Commanding Officer’s office, the stage for the unit’s Thankgiving revue and the Bali Ha’i set. All of these set pieces worked especially well in the outdoor setting of the Muny, with the real trees flanking the stage augmented by palm trees to suit the tropical location. There were a few issues with sound, such as microphones cutting out and some crackling that I’ve heard in previous productions this season, but overall, the production achieved the desired effect of transporting the audience to another time and place, and enchantngly so. This production seems to have been influenced a lot by the Tony-winning Lincoln Center revival, with its simple but elegant set and emphasis on some of the darker aspects of the show as well as the fully realized portrayal of the romance and de-cartoonization of some of the more comic characters (most notably Billis and Bloody Mary). Overall, this production was a thoroughly engaging presentation that brought a much-honored classic to modern audiences in a thoroughly winning and accessible way. It’s a demonstration of all that the Muny is capable of and a truly stunning evening of theatre. The Little Sisters of Hoboken have taken the stage in St. Louis. A low-budget off-Broadway show that turned into a franchise, Nunsense has finally arrived at the Muny in a full-scale production that, despite its sheer size, celebrates its humble origins and brings loads of laughs and a great deal of heart. It also features one of the strongest and most enthusiastic casts I have ever seen at the Muny. For this production,supervised by creator Dan Goggin, the show, which originally had a cast of five, has been expanded to fit the Muny stage with elements added just for the Muny, as well as a large ensemble of nuns and Catholic school kids for the dance numbers, and a few characters from the Nunsense sequels, such as Father Virgil (Lara Teeter) and Sister Mary Wilhelm (Ken Page). Also, the inept convent cook, Sister Julia, Child of God, has been brought into the show as an onstage character, played by St. Louis native and supporting player from NBC TV’s The Office, Phyllis Smith. The five leading nuns are still front and center, though–Reverend Mother Mary Regina (Dee Hoty), Mistress of Novices Sister Mary Hubert (Terri White), convent driver Sister Robert Anne (Beth Leavel), novice nun and aspiring ballerina Sister Mary Leo (Sarah Meahl) and the mysterious and forgetful Sister Mary Amnesia (Tari Kelly). The premise is the same as the original–the nuns have taken to the stage in a benefit to raise money to bury the four remaining victims of Sister Julia’s deadly vichyssoise soup, which killed 52 of the sisters in a mass bout of food poisoning. The show, which is essentially a revue with a plot, allows the various characters to tell their own stories and show off their individual talents while celebrating their lives as nuns. It also provides an ideal showcase for the Muny’s first-rate cast. As Reverend Mother Mary Regina, Hoty has just the right blend of authority and wackiness, with impeccable comic timing and a strong voice, and she leads a cast without a weak link. White, as Sister Hubert, has a booming voice and great presence, and works especially well alongside Hoty in the song “Just a Coupl’a Sisters”, as well as leading the company in the powerhouse Gospel-influenced “Holier Than Thou”. Meahl is also excellent as Sister Leo, displaying strong dance and comic abilities. If I had to pick stand-outs from this cast, though, it would have to be Leavel as the fame-seeking Sister Robert Anne and Kelly as the endearingly befuddled Sister Amnesia. These two in turn have two of the show’s most memorable numbers in Leavel’s “I Just Want to Be a Star” and Kelly’s “So You Want to Be a Nun”, which is simply astounding in showcasing Kelly’s ability to sing in two completely different vocal styles (operatic soprano and brassy Broadway belting) in the same song as she essentially sings a duet with herself operating the nun puppet Sister Mary Annette. There are also great turns in the smaller roles by Muny regulars Teeter and Page, as well as a funny performance by Smith as the defensive Sister Julia. The show emphasizes the limited budget of the nuns in recycling the sets from last week’s production of Shrek as well as making off-stage characters of the spotlight operator (Sister Mary Myopia) and the orchestra leader (Father Michael), adding to the charm of the production. This edition also adds many nods to St. Louis, from jokes about the Muny and the free seats to including a school uniform fashion show featuring students from the area’s Catholic girls’ high schools (with some funny narration provided by Teeter and Page). There are also some thoroughly entertaining dance numbers featuring the expanded ensemble, including the rousing Act 1 closing tap-dance extravaganza, “Tackle That Temptation With a Time Step”. I would imagine that the show might even be more appealing and relatable to Catholics, especially those who attended Catholic school and were taught by nuns, but its humor is broad and inclusive enough for anyone to enjoy, and it actively avoids stereotyping nuns as overly authoritarian and serious. 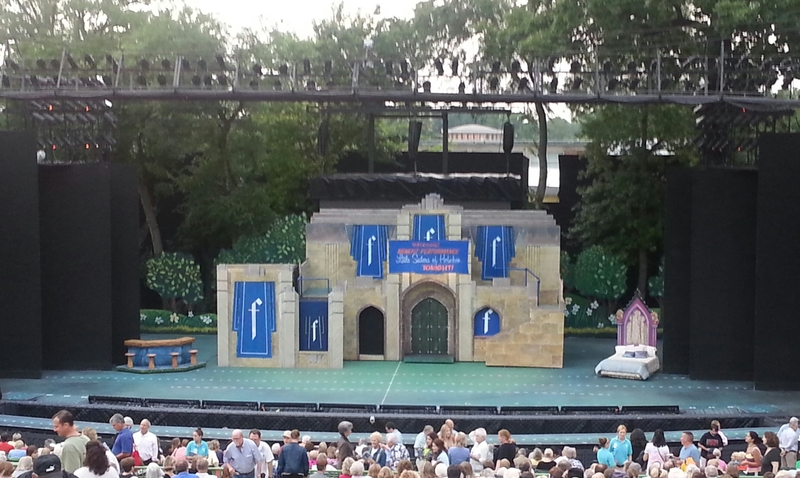 I had previously mentioned that season opener Spamalot was possibly the funniest show I had ever seen at the Muny, but Nunsense is a definite contender for that honor now. I don’t think I’ve laughed more at a single scene in a show than I did at the Reverend Mother’s monologue at the end of Act One, and there were many other side-splitting moments as well. I think one of the charms of this show and what makes it appealing to Catholics and non-Catholics alike is that it encourages the audience to laugh with the nuns rather than laughing at them. Everyone on stage seems to be having such a great time as well, and their enthusiasm is infectious. With this production, the Muny has proven that it can take a little show and make it bigger without losing any of its charm or humor. I would say that Nunsense, Muny Style is an unqualified success.